Myths and Reality of Domestic Violence. Some acts of violence are criminal, whether they occur within a relationship or not. The belief that domestic violence is a private affair condemns victims to remain under their aggressors’ control and makes it more difficult for others to intervene, which perpetuates the violence. Domestic violence is a serious problem in our society. Domestic crimes are rare—otherwise we would hear more about them. 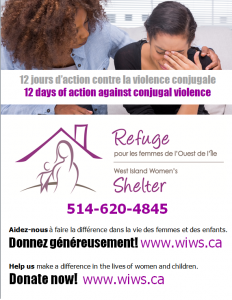 In 2008 police in Quebec registered 17,321 cases of domestic violence. The majority of the victims were women..
No one goes looking for violence or tries to provoke others. We alone are responsible for our behavior. No one deserves to be treated violently. Women who are victims of violence like it, or else they wouldn’t stay. Women stay with their partners for a variety of complex reasons. They believe their promises, she think he can change. Some women feel guilty about breaking up the family or are afraid of threats. Others are lacking the social or economic resources to make it on their own. Men who abuse their partners are not necessarily violent with friends or colleagues. Often the families and friends of these men don’t want to believe that they engage in such behavior, since they can be charming and pleasant in other environments. Women stay with their partners for a variety of complex reasons. They believe their promises, they think he can change. Some women feel guilty about breaking up the family or are afraid of threats. Others are lacking the social or economic resources to make it on their own. Women who endure an ongoing cycle of violence can often become ambivalent about their situation, unable to decide whether to stay or go. They may leave to see if they can survive on their own or return to see if things can change. This gradual process lets some victims eventually resolve their dilemma and break the cycle of violence..
Men who are violent at home are violent in all their relationships. Men who abuse their partners are not necessarily violent with friends or colleagues. Often the families and friends of these men don’t want to believe that they engage in such behavior, since they can be charming and pleasant in other environments..
Men who abuse their partners fit a certain profile: they’re physically imposing and talk loudly. Men who are violent toward their partners are regular Joes. They come from all backgrounds: they could be well-educated professionals or barely literate and jobless. There’s no typical profile. Violence isn’t an illness. It’s a behavior chosen by abusers to dominate and control others. Men are aware of what they’re doing and they’re doing it for a reason: to control everything and make all the decisions..
Men aren’t the only ones responsible for their violent behavior. Men are entirely responsible for their violent behavior. But they’ll try to blame their partners so their partners won’t leave them or turn them in. If men seek help and resolve their violence issues, everything will go back to normal and the couple will get along fine. Therapy addresses the problem of violence, but it’s not a miracle cure. The consequences and injuries suffered by victims of domestic violence won’t go away on their own. It’s important for victims to find ways to heal their physical, emotional, and mental wounds.. Therapy is a step in the right direction. Violent partners can change to the extent they truly want to and make sustained efforts to do so. Years of work could be required to change violent tendencies that have gone on for months or years. .